Basil Sydney is an actor most teachers of Shakespeare immediately recognize; he played Claudius in Laurence Olivier’s benchmark 1948 film of Hamlet. 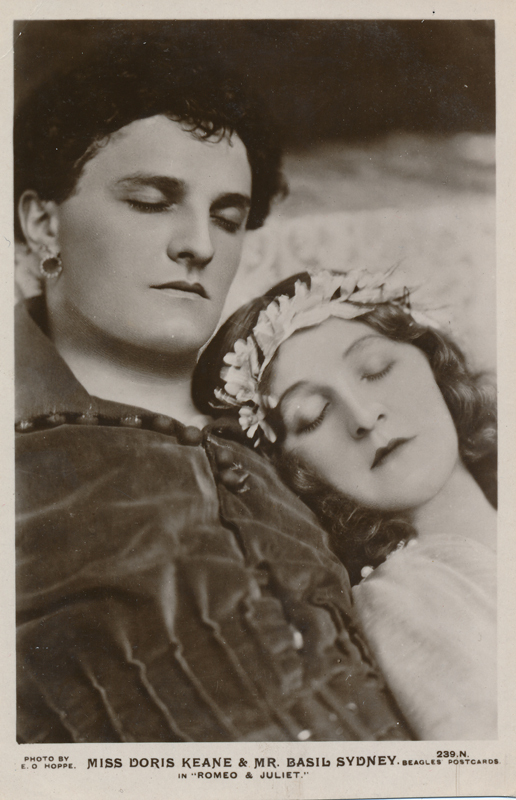 His first stage appearance was in 1911 and his first part in Shakespeare was as Claudius in 1914 at the Old Vic. Over the years he played Romeo, Mercutio, Hamlet, Prince Hal, and in 1914 appeared in productions of six of Shakespeare’s plays at Stratford-upon-Avon. He spent over a decade in New York playing the title roles in many Shakespeare plays in the mid-1920s. Between 1920 and 1964 he also had parts in sixty films and television productions. His first wife was Broadway star Doris Keane (pictured here), but they divorced and Sydney married twice more, to actresses Mary Ellis and Joyce Howard, before he died.